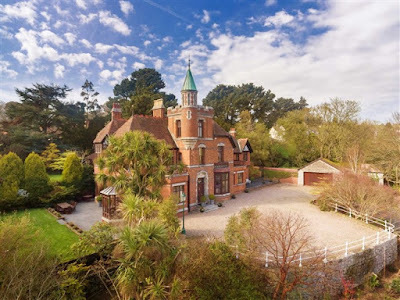 Saint George’s is, perhaps, the most impressive Gothic-Revival Victorian houses in Dublin and an important part of the story of Pugin’s architectural legacy in Ireland, and the house has come on the market in recent weeks. Saint George’s, which gives its name to Saint George’s Avenue, Killiney, is close to both Killiney and Dalkey. 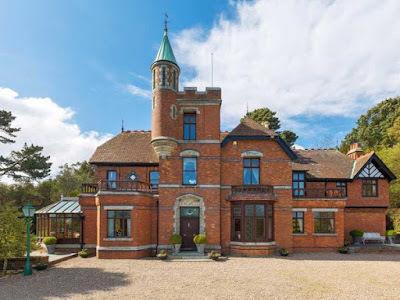 This towered and gabled red-brick house, built in the late 1870s, was designed by AWN Pugin’s son-in-law, George Coppinger Ashlin (1837-1921), one of the leading Irish architects of the 19th century. 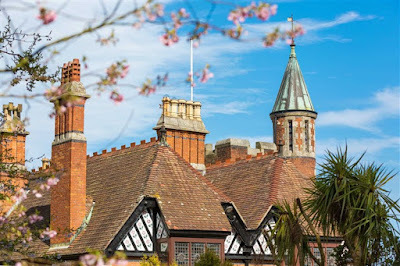 Ashlin built the house for his new wife, Mary Pugin, and in tribute to the legacy of her father, the Gothic Revival architect Augustus Welby Northmore Pugin. It is said he modelled Saint George’s on Mary’s childhood home, the Grange in Ramsgate, which was designed by her father. It took Ashlin several years to complete Saint George’s in the imposing styles of both the Gothic Revival and the Arts and Crafts movement. The house is entered through solid double doors underneath the tower. The floor in the entrance lobby has encaustic ceramic tiles with rich patterns that are typical of the style favoured by the Gothic Revival. The hallway opens to the inner hall with the main stairway and doorways on each side leading to the drawing room and dining room. The ground floor also includes the kitchen/breakfast room, a utility room and the service wing. The timber staircase rising to the first floor has an oratory on the first return. This small chapel was added in thanksgiving when Mary Ashlin gave birth to their daughter, Miriam Francis Xavier, after 10 years of marriage. There are five principal bedrooms on the first floor. From a central position on the landing, a secondary staircase leads up to the intimate, square tower room. A spiral stone staircase leads from the turret out onto the roof, with its breath-taking views across Dublin Bay. 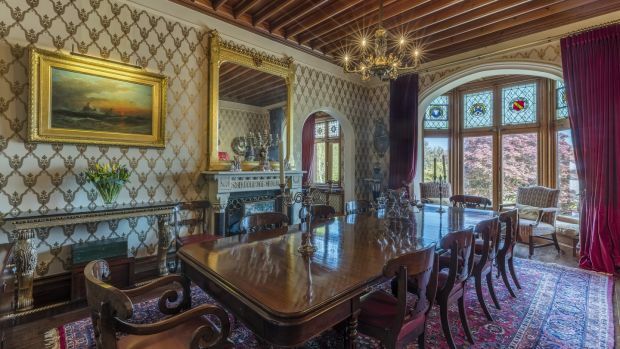 The house is bedecked with monograms and heraldic symbols representing the Ashlin and Pugin families. Almost every room in the house bears the initials of the occupants – on the fireplaces, in the delicate stained-glass windows, on the monogrammed brass handles on every door. 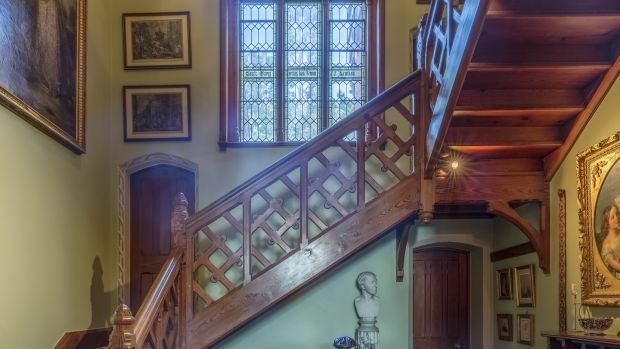 The original details in the house include the pine fireplace in the inner hall, the pitched pine staircase with Saint Brigid’s cross motif, Tudor archways, the twin ornate chimney pieces in the double-bayed drawing room and brass portiere rods holding back heavy drapes. The house has landscaped gardens and is set on about 0.46 ha (1.2 acres). 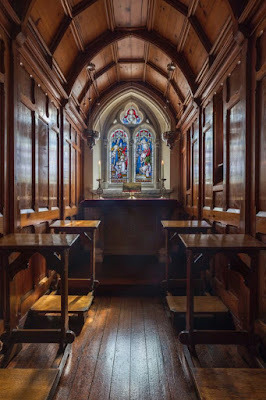 George Ashlin designed many prominent Irish religious buildings in Ireland, including Churches, schools, monasteries, convents. 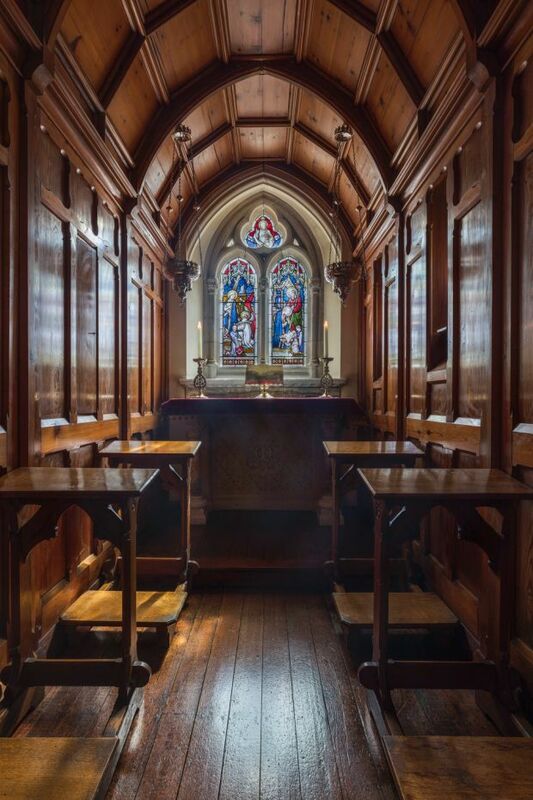 His works include Blackrock College, Mount Anville Convent, Clongowes Wood College, and the cathedrals in Cobh and Armagh. Other works that I have written about in the past include John’s Lane Church, Dublin, the Church of the Annunciation, Rathfarnham, Saint Kevin’s Church, Harrington Street, the Psychiatric Hospital in Portrane, Saint Maur’s Church, Rush, the former Presbyterian Church on Mallow Street, Limerick, the tower and spire of Saint John’s Cathedral, Limerick, and the Church of the Holy Cross or Daniel O’Connell Memorial Church, Cahersiveen, and Saint Joseph’s Church, Ballybunion, both in Co Kerry. George Coppinger Ashlin was born at Carrigrenane House, Co Cork, on 28 May 1837, the third son of John Musson Ashlin, JP, of Rush Hill, Wandsworth, Surrey, and his wife Dorinda Coppinger, whose family was from Co Cork. He was educated at the College of St Servais, Liège, and from 1851 to 1855 at Oscott College, near Birmingham, where he began preparing for a career in architecture. Ashlin became a pupil of AWN Pugin’s son, Edward Welby Pugin (1834-1875), in 1856, first in Birmingham and then in London, where he was also a student at the Royal Academy (1858-1860). When Pugin took him into partnership, he gave him responsibility for setting up a Dublin branch of the practice and taking charge of the Irish commissions, which by then included the large new church of Saint Peter and Saint Paul in Cork. By 1861, Ashlin had opened the Dublin office of Pugin and Ashlin at 90 St Stephen’s Green. Many of the commissions that followed quickly were for Roman Catholic churches, convents and monasteries throughout Ireland, including Saint Colman’s, the new cathedral in Queenstown (Cobh), Co Cork. Ashlin married Edward Pugin’s younger sister, Mary Pugin (1844-1933) in 1867. Although the partnership of Pugin and Ashlin was dissolved in 1868, the family ties remained close, and Ashlin is said to have been in partnership with his brothers-in-law, Peter Paul Pugin and Cuthbert Pugin from 1875 to ca 1880. However, Ashlin now worked under his own name in Ireland, and continued his highly successful practice. In 1903, Ashlin invited his former pupil and office manager, Thomas Aloysius Coleman (1865-1960), to join him in the new partnership of Ashlin and Coleman. He was a cousin of my great-uncle, Francis Coleman, who married my grandfather’s eldest sister, Mary Comerford, in 1889. Other former pupils and assistants included Thomas Joseph Cullen (1879-1947), who lived in his later years at Sally Park, Firhouse, and Alfred Ignatius McGloughlin (1863-1939), a brother-in-law of Patrick Pearse, who supervised the Portrane Asylum project from 1895 before emigrating to the US. 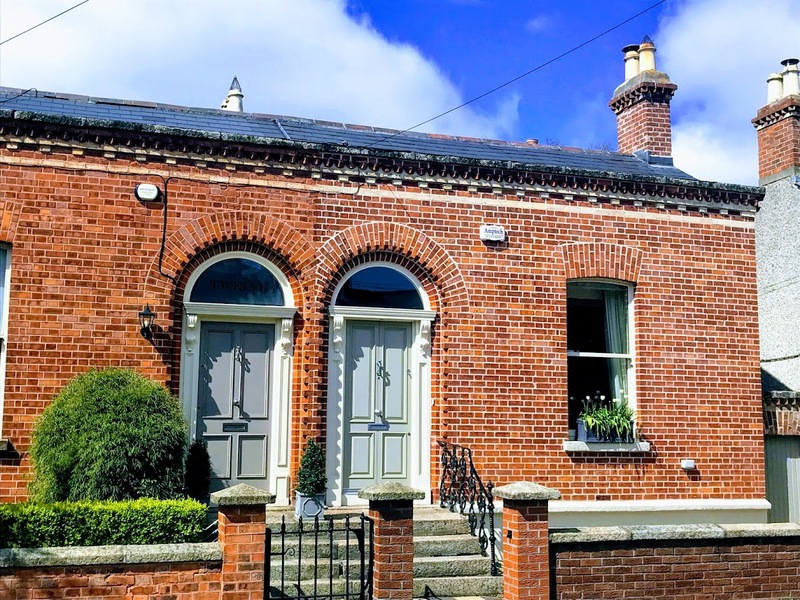 Ashlin’s offices were at 90 St Stephen’s Green (1861-1879), 41 Westmoreland Street (1879), 1 College Street (1880-1886), 10-12 Trinity Street (1888-1893), 3 Merrion Street Lower (1894-1895) and 7 Dawson Street (1896-1921). Ashlin has been described as having ‘a quiet and retiring disposition … with a certain inherent shyness.’ Alfred Edwin Jones, who became a pupil in Ashlin & Coleman’s office around 1911, described Ashlin as a tall, commanding figure with ‘an appearance of distinction.’ Each morning, he caught the train from Killiney to Westland Row and then walked to his office at 7 Dawson Street, where he would mount a waiting horse, canter up Dawson Street to Saint Stephen’s Green and ride several times round the park before starting the day’s work. He was active role in the affairs of the architectural profession throughout his career and was President of the RIAI from 1902 to 1904. Ashlin died at Saint George’s at the age of 84 on 10 December 1921. He was buried in the family plot in Glasnevin Cemetery. His only child, Miriam Francis Xavier, married his nephew and partner, Stephen Martin Ashlin (1879-1942), in 1904. Miriam died in 1937 and Stephen died in 1942. 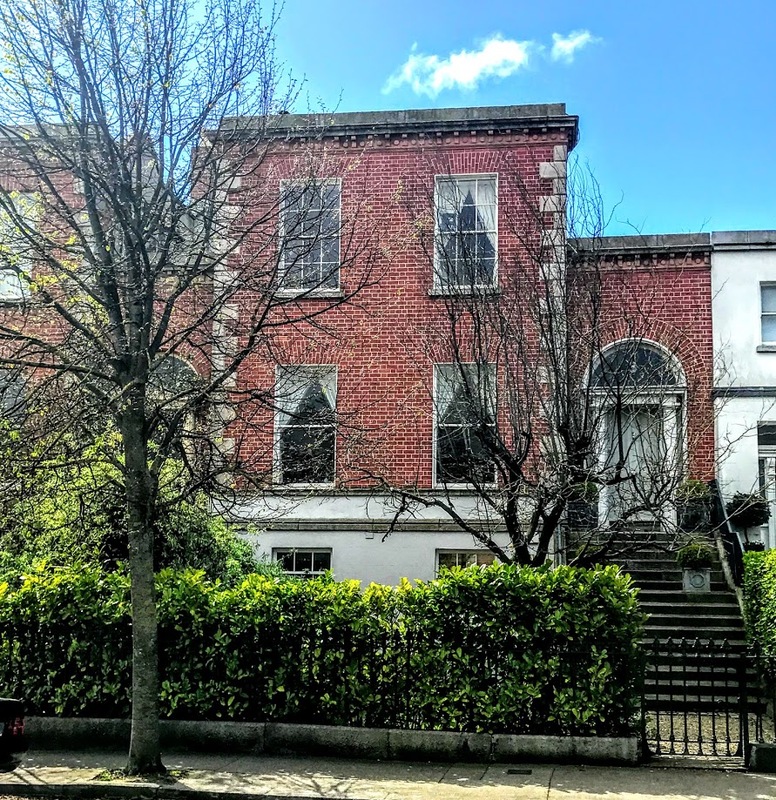 The current owners of Saint George’s, Dr Robert McQuillan and Dr Jane McQuillan, are only the fourth owners in the history of this house. 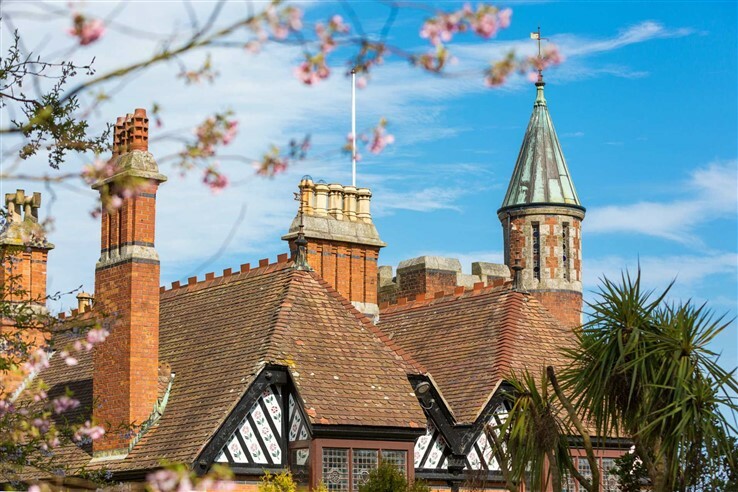 They moved into St George’s almost 30 years ago, and they have embraced its significance as an exemplary Arts and Crafts home, painstakingly preserving and restoring every element of the original design. Saint George’s is for sale through Knight Frank, with an asking price of €9.25 million. 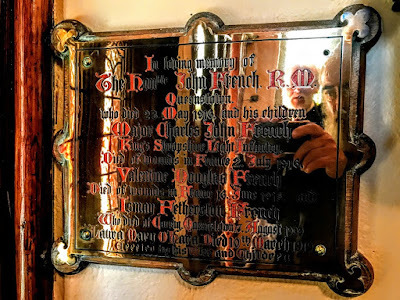 Before yesterday’s lecture at the Royal Irish Academy on using church records as sources for genealogy, I decided to revisit the Church of the Holy Name on Beechwood Avenue in Ranelagh to photograph the memorial plaque to John French and his family in the south porch. The photograph of the memorial helped to illustrate how church records as genealogical resources are much more than merely the registers of baptisms, marriages and funerals – the records of what clergy sometimes refer to as ‘Hatch, Match and Despatch.’ But it also provides an introduction to the story of how John French’s parents had to marry each other twice – once in a Roman Catholic Church and then again in a Church of Ireland parish church – because of the sectarian provisions of Irish marriage laws before the Disestablishment of the Church of Ireland. 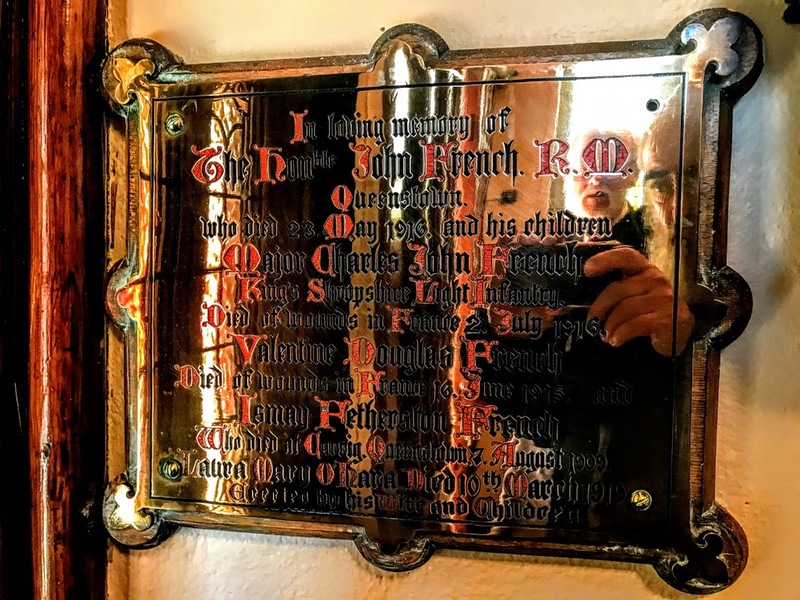 Those laws were so discriminatory that John French never inherited his father’s peerage, which descended instead through the children born after his second marriage in All Saints’ Church, Grangegorman. Walking in the warm sunshine from Rathmines to Ranelagh on a bright May morning was a pleasant experience, and brought me by No 3 Belgrave Road, formerly Overseas House, where I worked for four years after leaving the staff of The Irish Times, from 2002 to 2006, when I joined the full-time staff of the then Church of Ireland Theological College. Then, as I walked along Upper Beechwood Avenue, I passed No 11 Upper Beechwood Avenue, where my great-grandfather, James Comerford, and my grandfather, Stephen Edward Comerford, had lived at the beginning of the 20th century. As I continued on, I noticed for the first time a commemorative plaque that was unveiled last year [14 January 2017] at No 54 Upper Beechwood Avenue, where the former editor of The Irish Times, Douglas Gageby, was born in 1918, and the trade union leader Jim Larkin, founder of the ITGWU, now Siptu, had lived there briefly in 1924. (Robert John) Douglas Gageby was born at 54 Upper Beechwood Avenue, Ranelagh, on 29 September 1918. His parents were Thomas Gageby, a Belfast-born civil servant, and Ethel Elizabeth (née Smith), a schoolteacher from Co Cavan. His paternal grandfather Robert Gageby had stood as a Labour parliamentary candidate in Belfast North in 1910, and was a Belfast City Councillor for 20 years, first elected in 1898 as a trade union candidate supported by the Independent Labour Party. The Gageby family moved to Belfast when Douglas Gageby was about three when his father went to work for the Northern Ireland Civil Service after partition. He was educated at Belfast Royal Academy and Trinity College Dublin, where he was elected a scholar in 1940 and studied Modern Languages (French and German). At the outbreak of World War II, he enlisted in the army as a private, was later commissioned, and served as an intelligence officer. He reported from post-war Germany for the Irish Press and went on to work with Conor Cruise O’Brien at the Irish News Agency. In 1954, he became the first editor of the Evening Press. He became editor of The Irish Times in 1963, and remained there until 1986, having been brought back from a short retirement in 1974, the year I joined the staff of The Irish Times from the Wexford People. He is credited with moving The Irish Times from a Unionist organ to the Irish newspaper of record. Douglas Gageby’s wife Dorothy was a daughter of Seán Lester, last Secretary General of the League of Nations. He died on 24 June 2004. The plaque at No 54 was funded by former Irish participants in the Journalistes en Europe fellowship programme in Paris. 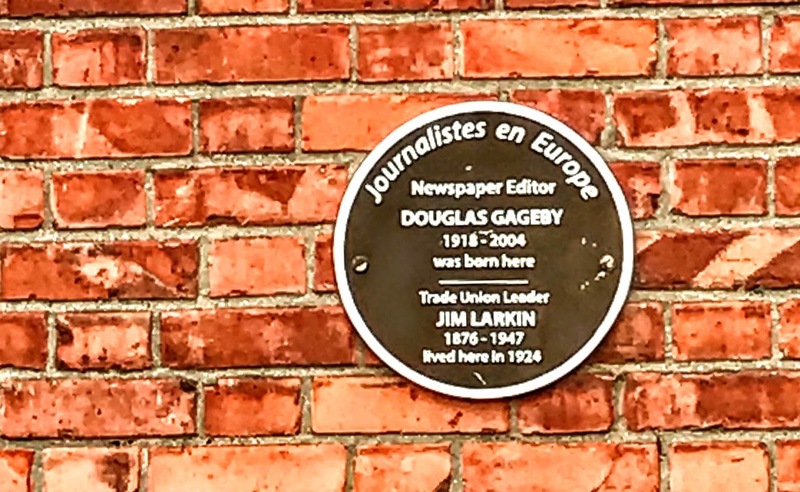 For many years, Douglas Gageby was a member of the Council of Journalistes en Europe. The Journalistes en Europe programme was based at Rue Montmartre in Paris. It was founded in 1974 by the French journalist and Resistance fighter Philippe Viannay; the former managing director of Reuters Gerald Long; and the founder of Le Monde, Hubert Beuve-Méry. Douglas Gageby was the Irish representative on the board. Funding came from the European Commission, governments, and private benefactors, including the late Tony Ryan. Douglas Gageby was instrumental in my being offered a fellowship programme funded by Journalistes en Europe and the Nihon Shimbun Kyokai, the Japanese Newspaper Publishers’ Association, that allowed me to study and live in Japan for a full term in 1979. Two of us travelled out in May 1979, through London, Damascus (Syria), Dhahran (Saudi Arabia), Karachi (Pakistan) and Beijing (China). I stayed at Asia Bunka Kaikan, a student hostel in Tokyo, with another young journalist from Barcelona I travelled the length an breadth of Japan, from Hiroshima in the south-east to Hokkaido in the far north, and reported for The Irish Times from the G7 summit, where I met Jimmy Carter and Maggie Thatcher. We returned to Ireland in August 1979, this time through Beijing, Islamabad, Ankara and London. Later that year, he also sent me to Paris, and I returned to Japan in 1981, as well as visiting Hong Kong, in 1981. These were life-shaping and life-changing experiences for a young journalist still in his mid-20s. Other Irish journalists who benefitted from the Journalistes en Europe programmes include Helen Shaw, Chris Dooley, Doireann Ní Bhriain, Elgy Gillespie, Walt Kilroy, Katie Hannon, Lorna Siggins and Gerry Flynn. Sadly, following a decision by the European Commission to withdraw its funding, which was a significant proportion of the budget, the programme was forced to take the decision to close down in 2003. 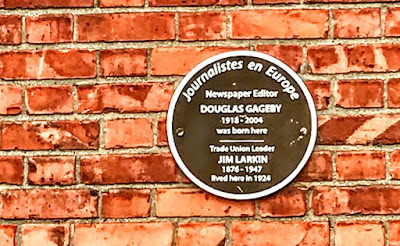 Journalistes en Europe / Newspaper Editor / Douglas Gageby / 1918 – 2004 / was born here / Trade Union Leader / Jim Larkin / 1876-1947 / lived here in 1924. 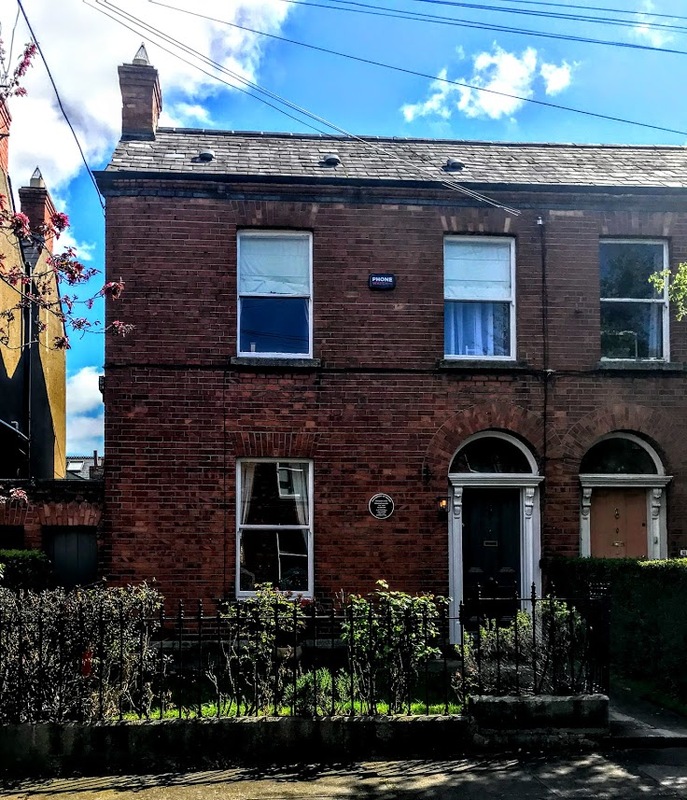 A few months after the plaque was unveiled last year, the house was on the market through Young’s, with an asking price of €840,000. The estate agents said then that the house still has decorative features from the days the Gageby and Larkin families lived there.